Emma here, the receptionist from Epona Tattoo! I will be your guide through the wonderful and sometimes confusing process of getting a tattoo. If you contact Epona by facebook or email it is probably me that you will be speaking to. Most people prefer to book a consultation before they take the big step of booking a tattoo. This gives you a chance to meet your tattooist, chat through what you want in detail and to see if you are comfortable at Epona. If you are not sure which tattooist you would like a consultation with you can look at our artists portfolios here or check out our facebook page. You can also speak to me by ringing +44 (0) 1636 815771 during shop opening hours, if I am not able to answer please leave a message. 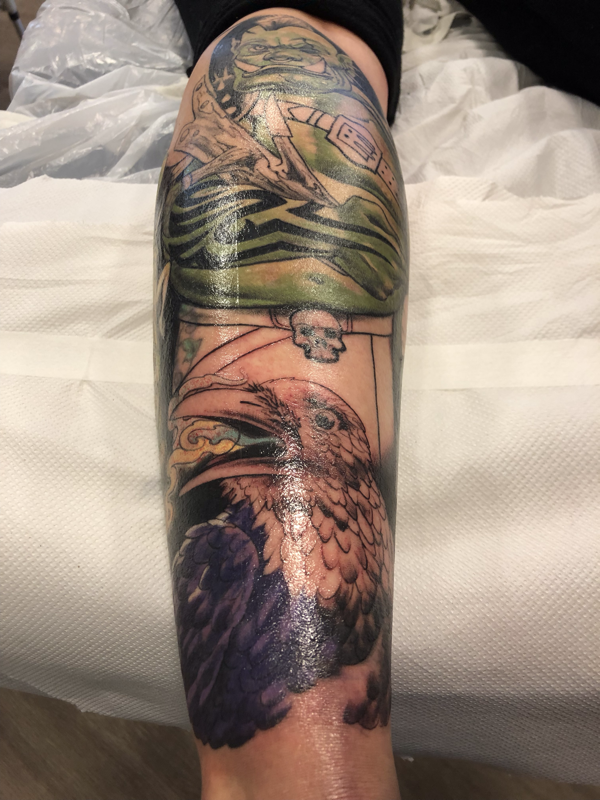 When you come to see us we ask that you bring in some pictures of the sorts of tattoos that you like as well as some idea of the subject matter and placement of your tattoo. If it is easier you can send these images to us via email or on Facebook Messenger. When we design work for our clients we take into account both the subject matter that they want and the style of tattoo work that they like. We come to an understanding of this through our consultation process so the consultation is useful for both you and your tattooist. If it is difficult for you to get to a consultation please let us know and we can arrange a phone consultation. 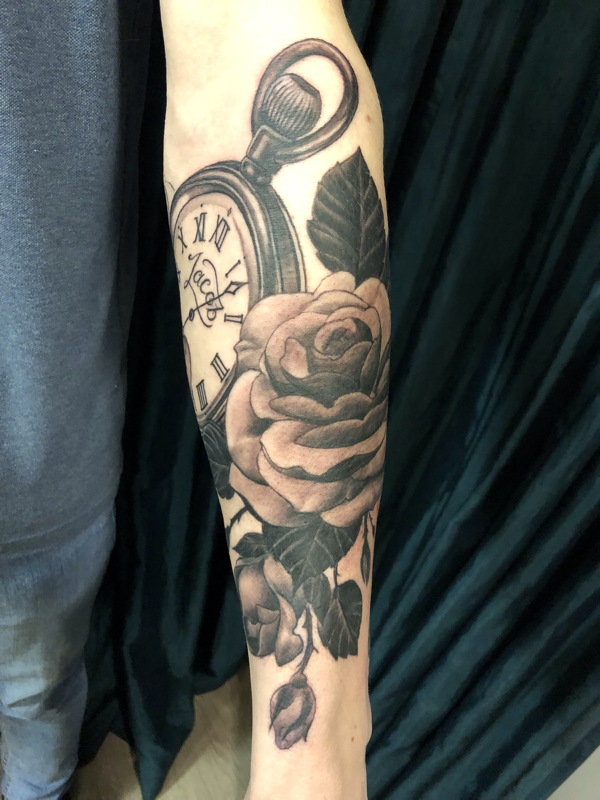 Occasionally, if a tattoo is very simple or if a client has worked with one of our tattooists previously you may be given the option to skip the consultation. Whether it is your first tattoo or just your first one at Epona here is a quick example of what you an expect. When you first come in you will be greeted with at big hello and a tea or coffee. Your tattooist will being arranging the final setup (we don't set up our machines until you have arrived for hygiene reasons). Once the paperwork has been completed - don't forget to bring your ID - we will start the process of preparing you for the tattoo. This will involve washing and shaving the area to be tattooed and then making sure the design is positioned correctly. Tattoo designs are generally transferred to the skin in two ways, by either using a stencil paper or by drawing them on by hand. The type of tattoo you are getting will determine which of these two processes will be used though most tattoos are actually a combination of both. 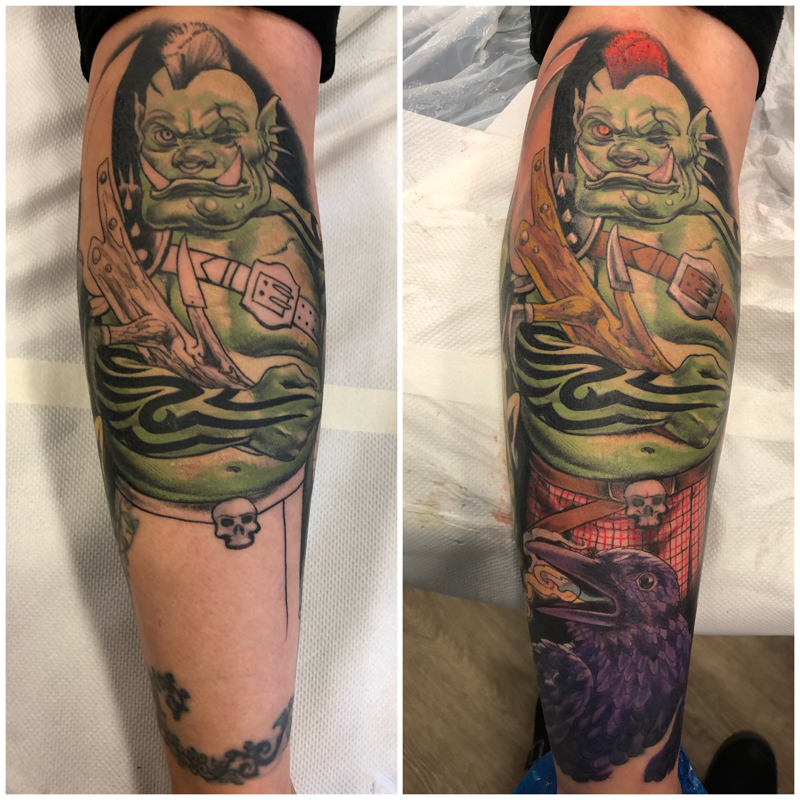 If you are getting a cover-up or rework of an old tattoo it is most likely that you will have most or all of your tattoo drawn on by hand. Examples of these two processes are given n the pictures below. Once your tattoo is transferred we are ready to go. You will need to be able to sit (or lie) for an extended period of time so feel free to bring along some headphones and some music or a film to watch if you think that will help you pass the time. 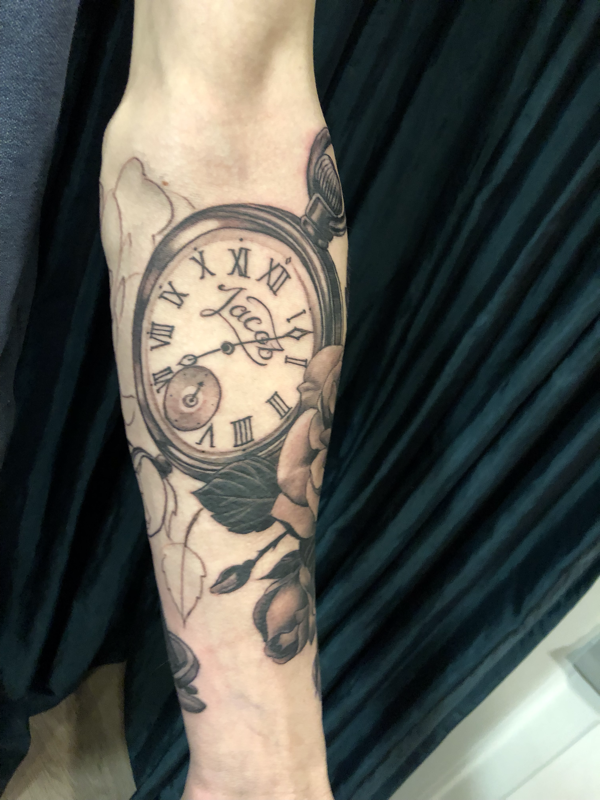 If you need to take a break or to go to the toilet just let your tattooist know, for longer sessions your tattooist will also need to take a break every hour or so. here we have an existing tattoo to be added to, incorporating a cover up at the bottom. The Raven is drawn on freehand using new clean sharpie pens instead of using a carbon stencil. This allows the artist more freedom to integrate the new tattooing more seamlessly into the existing work. 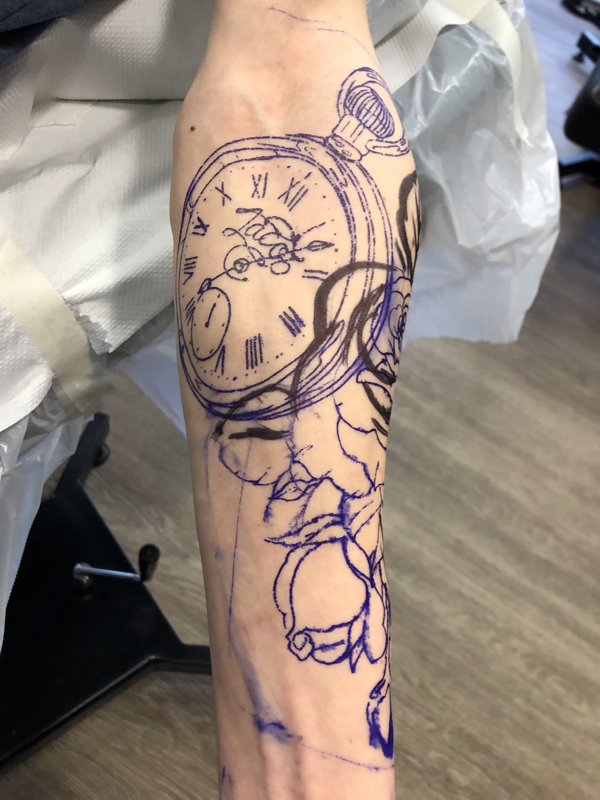 here we have an example of a predrawn tattoo design of a pocket watch and rose. 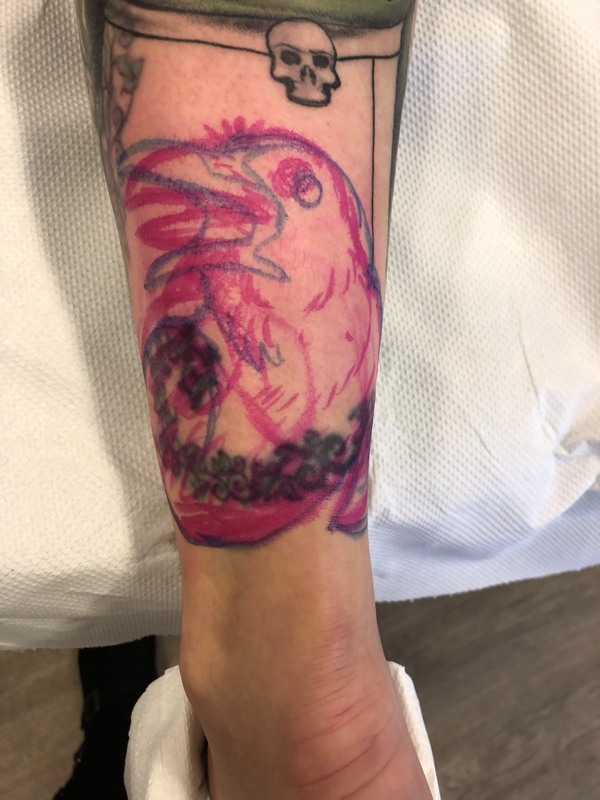 The drawing is transferred on to carbon appear and applied to the skin with purpose made stencil application fluid after thoroughly cleaning and preparing the area to be tattooed. Last minute alterations are made using a new clean sharpie pen. Ensure you have eaten a good meal within an hour of your appointment time. Tattooing can cause a sudden drop in blood sugar levels and so it is always a good idea to make sure they are up and stable. You are welcome to bring snacks and food with you. BRING YOUR ID! Environmental health now requires us to check Identification documents for all of our clients, not just those under 25. Being distracted helps. You are welcome to bring along headphones and music or a film to watch - something to keep yourself occupied as being tattooed can be very very boring! Sugar-load! Don't eat nothing but sugary food and drinks before your tattoo, this will de-stabilise your sugar levels and can lead to fainting and light-headedness, please eat a balanced meal with carbs and proteins with two hours of your tattoo appoimtment. You are welcome to bring snacks and food with you. Bring along your entire family and all your mates. Our tattoo studio is not large and we do not have enough room for everyone so they will unfortunately be asked to wait elsewhere. We are sometimes able to accommodate one friend or family member but please also remember that tattooing is the world's most boring spectator sport so they come at their own peril! When a tattoo is first done it is an open wound and as such it is open to any bacteria that you expose it to. It is important therefore, that you follow the instructions given to you by your tattooist. Once your tattoo is completed it will be dressed and sealed from the environment. Please leave this dressing on until the next morning to give your tattoo a chance to heal a little before being exposed to the outside world and all it's bacteria. 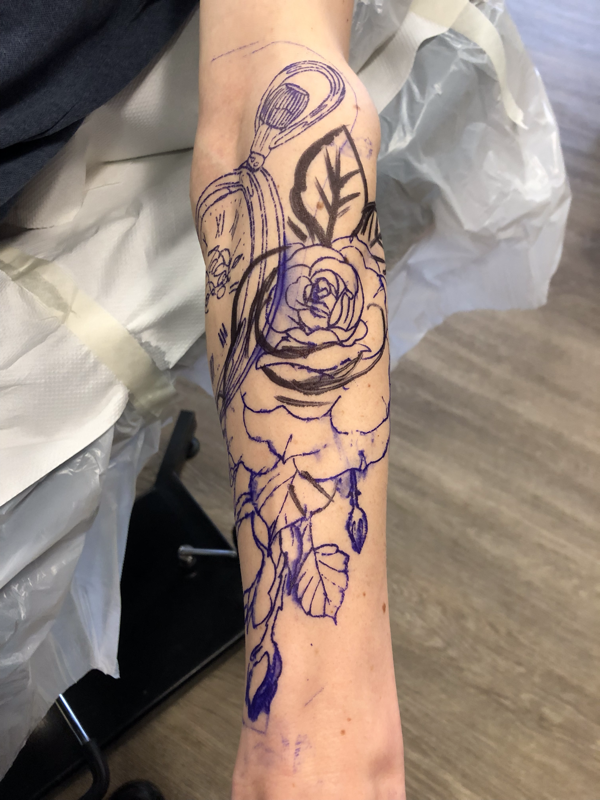 Your tattooist will go through our aftercare instructions with you and give you them in writing but if you forget them you can always find them here again. Please leave the dressing on until the following morning. We advise removing it as soon as you can on waking up, preferably in the shower. Wash gently (with clean hands) with your soap and gently pay dry with a clean towel. Keep your tattoo clean, this is the most important part of after care. Please wash your tattoo 3 times a day. Wear Loose clean cotton clothing over your tattoo whilst healing. After a couple of days your tattoo will develop a light scab . Do not pick or scratch LEAVE IT ALONE! Continue to wash & apply cream. Picking scabs removes colour and could cause infection. During your healing process if your tattoo feels tight or uncomfortable, apply a TINY amount of recommended ointment to relive it. DO NOT re-bandage the tattoo whilst healing. NO exposure to direct sunlight during the healing. What Does the Epona Studio look like?